February ended with a roar, a dinosaur roar! 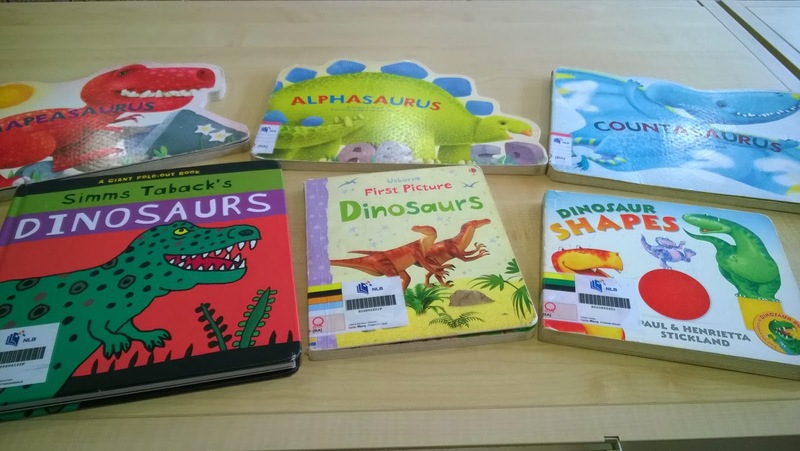 Unlike space, transportation and animals which were easy hits back when we were doing monthly themes, I wasn’t sure how B would take to dinos – I mean, the names are hard to pronounce and animals are all dead and scary looking (except for Barney, but he’s not quite … real). 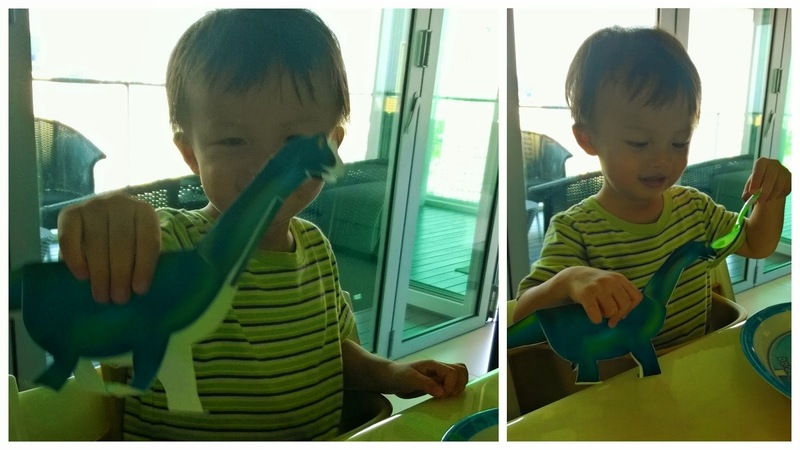 By the end though, B was impersonating the T-Rex walk, wrapping his tongue around “triceratops,” “apatosaurus,” “stegosaurus,” and knew how to spell “D-I-N-O-S-A-U-R” with playdough. A success! 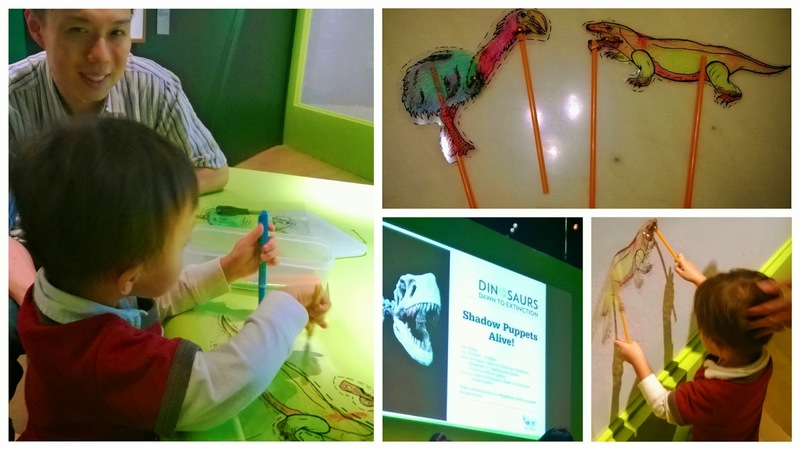 Lucky for us, there were TWO great dinosaur showcases in Singapore this past month, both different yet good. 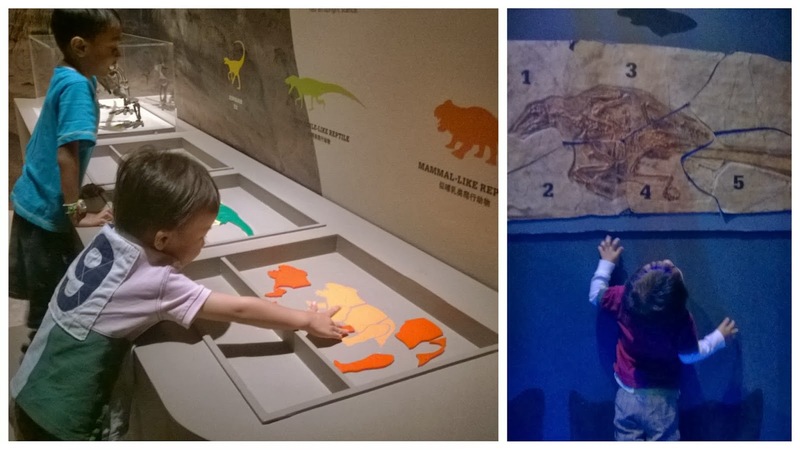 We first visited Titans of the Past – Dinosaurs and Ice Age Mammals at the Science Center. To be honest, we’d trekked out west before for the Megabugs Return exhibit butweren’t too impressed. I felt the center overall could do with some upgrading. However, this time, we were pleasantly surprised by the toddler friendly activities and animations that managed to keep 2+ year boys entertained throughout! It’s a shame the exhibit is over so soon (25 October 2013 – 23 February 2014) and not that well publicized. When we went on a Thursday afternoon, there were less than 10 visitors there. Besides pressing all the buttons to make them roar and eat, B also enjoyed the mini paleontologists sandpit dig where they brushed for fossils. We also went to Dinosaurs: Dawn To Extinction at the ArtScience Museum (25 January – 25 May 2014), getting there just before 5p in time for the free English tour. IMO, the exhibits here were of better quality and clearer presentation, with bone fossils AND life size models, info boards and occasional activity stations. The caveat was we had to pay admission for B whereas he got in free (under 3 years) at the Science Center. That said, even distracted mommy retained a few bits of knowledge in between making sure my lil live dino didn’t break anything! B attempted to fit all the puzzles, but most were set too high for toddlers – and he’s quite tall at 95cm+ (for 27 months). 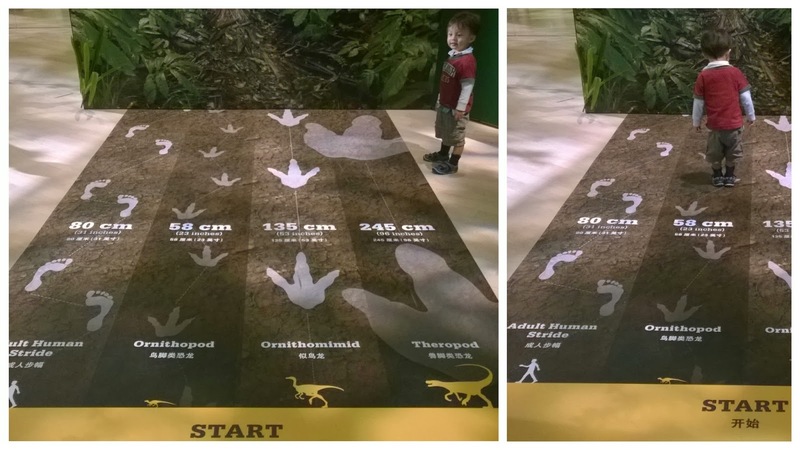 He also enjoyed the model of the walking T-Rex and the footprint section, where you could make your own track, identify and compare various footprint tracks. Go here to see the other kid-friendly events and activities coming in March (booking required) if you have older kids, 6 years and up. Tracing and colouring pre-writing worksheets from here. 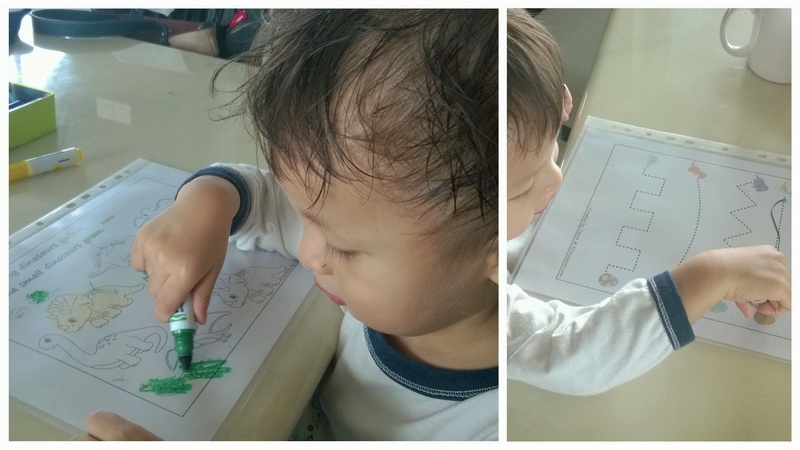 His fine motor skills aren’t great, but he’s slowly improving, i.e. changing colours for different objects, following straight and curvy lines, etc. How many ways can you play-doh? A family that runs together…. finallymama on Who Am I? Lisa Kok on Who Am I? Learning to swim, le… on Are all babies water babies?